The discovery of cultural sights and attractions is even more exciting when it becomes an adventure. 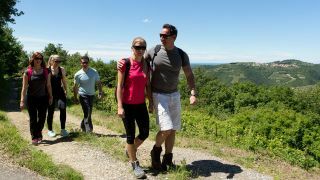 The rich cultural heritage of Piran and its surroundings is connected with six hiking paths, with different lengths and complexity. Explore the picturesque and cultural sights/attractions of the town's centre following the cultural, sacral or historical paths. Discover the source and the healing properties of nature's white gold from the local salt pans, walk along the Austro-Hungarian riviera or follow the path of the legendary Boškarin in the hinterlands. Discover the paths, each telling its own authentic story and creating original experiences! Immerse yourself in the cultural legacy of the town, which lives on to this day. Have a look at the detailed and richly decorated religious monuments. Listen to the mysterious stories of the past. Stroll along the coastal promanade with an important history. All the cultural paths are collected in the handy brochure with a map. You can download the brochure for free and begin exploring immediately. The interactive Nexto app leads you through riddles, challenges and the many tasks that will take you around and present the cultural and historical sights of Piran. The best thing is, it's totally free!